I hope you are enjoying your holidays and had a fabulous start to the New Year. I wish each and every reader of Sailu’s Kitchen a very happy, healthy, safe and fruitful 2013. Happy New Year, dear readers! Let’s usher in the New year with a colorful, indulgent dessert. 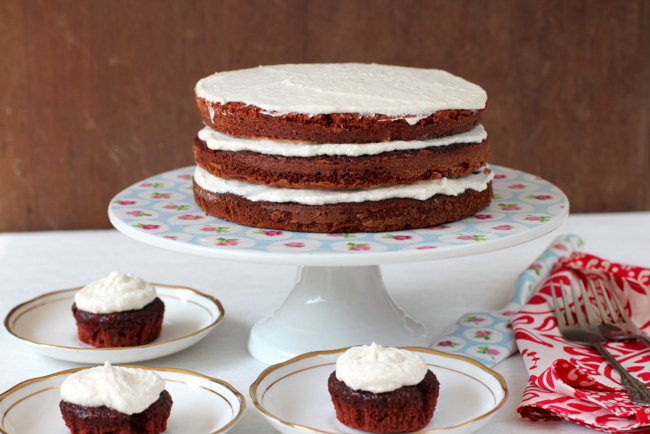 Dear readers, I have for you Red Velvet Cake recipe with cream cheese frosting. 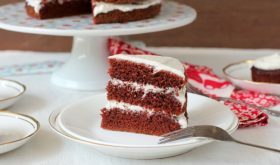 The only downside of the red velvet cake recipe is the copious amount of red food coloring that is used to achieve the red color of the cake. 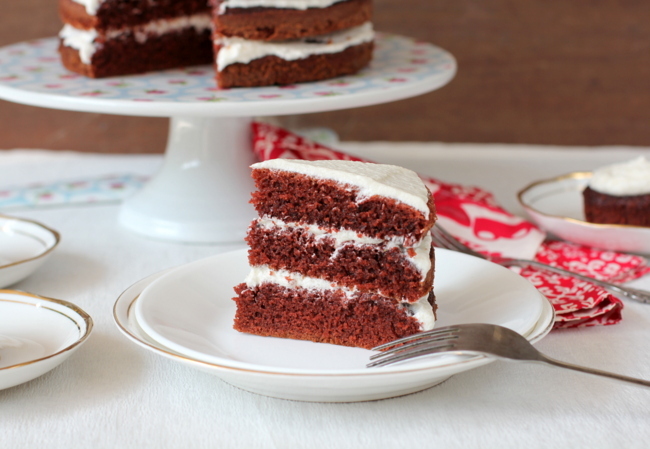 Moist, incredible flavor combination with cream cheese frosting, red velvet cake is melt in the mouth delicious. The cake pairs beautifully with cream cheese frosting where the tartness balances out the sweet flavor of the cake. The recipe below yields four 7″ round cakes. I made three 7″ round cakes and used the remaining batter to make cupcakes. Preheat oven to 170 C. Grease and dust three 8" round cake pans or four 7" round cake pans or two 9" round cake pans.. In a large bowl, sift flour, salt, baking powder, 1/2 tsp baking soda and cocoa powder. Keep aside. In a small bowl, lightly beat the eggs and add the butter milk and mix. Keep aside. In a large bowl, add oil and sugar and beat for 3 to 4 mts until well combined. Add the vanilla essence, egg-buttermilk mixture, red food coloring and coffee mixture and mix until well combined. Slowly add the flour, about 1/3 cup at a time and mix to combine. Do not overbeat. Repeat till all the flour is blended into the batter. Mix 1/2 tsp of baking soda with a tsp of distilled vinegar and as it sizzles, add it to the cake batter and mix. Immediately pour the cake batter into the prepared pans. The batter should fill only half the pan and not more since the cake with rise on baking. Bake in pre-heated oven at 170 C for 40 to 45 mts. Check from 35 mts onwards. Large cakes take more time to bake than smaller cakes. Cool the cakes for 5 mts and then invert each onto a plate, then invert again on the right side of cake onto a cooling rack. Allow the cakes to cool to room temperature..
To prepare the frosting, in a large bowl, beat cream cheese and butter for 3 mts with an electric mixture. Add the vanilla and mix. Add sieved powdered sugar a little at a time and beat until frosting is light and fluffy approx 4-5 minutes. To assemble the cake, place one cake layer on a cake plate, level the cake (if the cake has a dome shape use a serrated knife to level) and spread a quarter of the frosting on top. Place another cake layer over it and level the cake. Spread a quarter of the frosting on top. Place the third cake layer on top, level the cake and spread frosting on top. You can frost the sides with the remaining frosting. I have not frosted the sides. The cake batter is runny. Fill the pan half way through only and not more. Usually, after leveling the cake, there will be crumbs and when frosting the cake, the crumbs will mix with the frosting. To avoid that, I usually invert the cake (upside down) since there will be no crumbs and its easier to frost. You can even crumb coat with a thin layer of frosting, set in fridge for half an hour and then spread a generous amount of frosting over the crumb coat. By Sailu Published: January 1, 2013 One of the best dessert recipes I made for New Year's eve is Red Velvet Cake recipe with cream cheese frosting. Moist cake with a delicious frosting. You can use a small peice of beetroot boiled and pureed. I have made this cake very often using the same. Replace 1 egg with 1 tbsp flax seed powder. Add the flax seed powder to 3 or 4 tbsps luke warm water and leave aside for 5-7 mts. Beat well for 3 mts and use them in place of eggs. ate this cake at a friends place. It was yum. Distilled vinegar is white vinegar that is basically used to give a acidic touch to the dish. 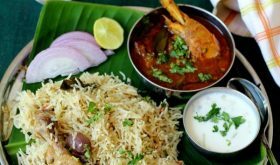 The color used for biryani rice is yellow and not red. You can use red powder food coloring but reduce the quantity of color used if using powder based colors. 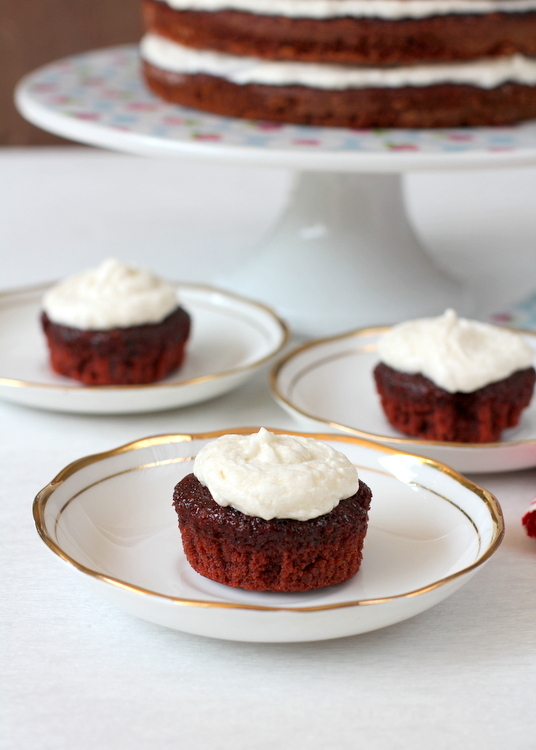 Red velvet is my favorite after chocolate in cakes…Yum!! Thank you so much for the recipe and the other tips. Your recipes all turn out to be awesome, at the same time, very simple to make. Thank you for the innumerable recipes that you have posted, and inspiring the chef in us :). 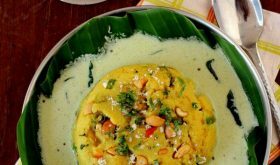 Not sure where you are based, but can you tell me where to buy authentic food colors (preferably powders) and are plant based (I am a strict vegeterian), in and aroung Vizag? 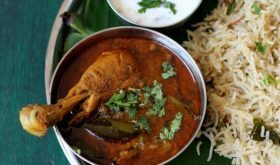 This recipe could be easily cooked in home without wasting much of time. 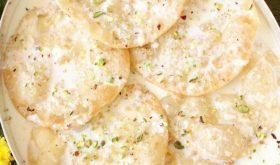 One of the best desserts for birthday party or any function. Distilled vinegar is white vinegar. Yes, you can make the cake without red color. But it will not be Red Velvet cake. 🙂 You can add beetroot paste to achieve a reddish shade. Please tell me if I can make this cake without using eggs, what can I substitute it with? OR (if you do not have flax seeds) instead of 3/4 cup buttermilk, use 1 cup. Add a tbsp of vinegar and increase baking soda by 1/2 tsp. finally made the red velvet cake day before yesterday and it was polished off by my kids and husband before I could even think of frosting it. so I made it again yesterday (eggless version this time) for my parents and once again I am left with a measly two slices. 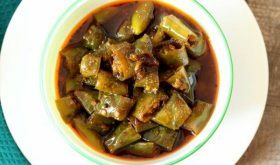 Thanks a ton for such a great recipe. Now my son wants me to bake the same for his 13th birthday next friday. Can you suggest some other frosting for this cake? 2. My family is a huge fan of the Fruit biscuits and salt biscuits from Karachi Bakery. I have tried many recipes but have not yet got the correct texture so far. I have a feeling that you can help me out here. keep up the good job at your blog. Can you plz suggest the alternate for cream cheese.